Slow food and slow cooking are great comforts; especially as cooler fall and winter air make their way our area. One of the best ways to warm your bones is to spend time in the kitchen, making the foods that you find comforting and warming from the inside out. Risotto is one of those dishes. At its basic level, it's warm, creamy and satisfying...in terms of both texture and richness. But, Risotto is also the perfect canvas for an assortment of flavors...from wild mushrooms, to roasted vegetables (another slow food favorite in our kitchen), to seafood, and of course, any number of cheeses that your heart desires. From time to time, we'll use risotto to showcase a great vegetable find at the farmer's market, like a butternut squash. But, risotto can also stand up to bold add-ins like blue cheese. The beauty of the dish is that you can coax the most creamy, decadent texture from the rice and then give it any flavor profile you like. 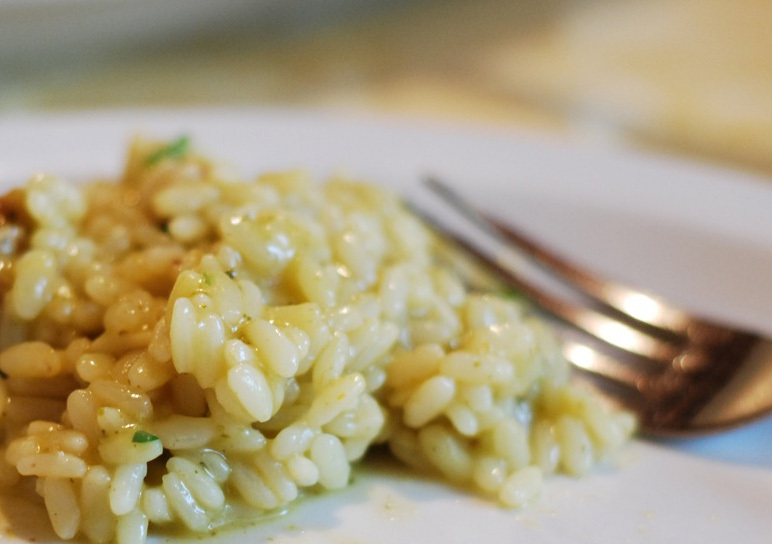 Risotto is traditionally made with Arborio rice, a short-grained rice with an incredibly starchy exterior. Slowly cooking and stirring the rice releases the starch, creating a creamy rice dish that's perfect as a small first course or as an accompaniment to the main entree. Risotto is totally approachable in the kitchen...all it takes is a little patience and the willingness to put a little love into the dish. Use this recipe as a blank canvas for your favorite flavors-- roasted red peppers, wild mushrooms and Parmesan are just a few ideas. What are your favorite risotto flavors? Heat a large saute pan on medium high heat. Add the butter and allow it to melt. Add the rice and shallot. Toasting the rice and shallot develops their flavor, giving the rice a nutty, toasted flavor. In a separate pot, warm the stock or broth. Gently stir the rice around the pan until the butter is absorbed. Add the white wine to the pan and let it absorb into the rice. The alcohol will evaporate while the rice absorbs the flavors of the wine. Add the Bay Leaf to the rice as well. Reduce heat to medium and continue stirring frequently. Add 1 to 2 ladles of warm stock to the rice and continue stirring. 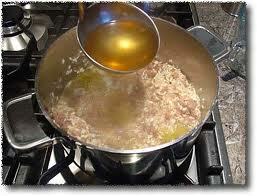 When the stock is almost completely absorbed, add another 1 to 2 ladles of liquid. Continue for 20-25 minutes until the rice is tender; the amount of stock you need will vary. Remove the Bay Leaf, and finish the dish with a tablespoon of butter stirred into the rice, or a dusting of Parmesan and fresh herbs on top. Add roasted vegetables or wild mushrooms after the wine has absorbed into the rice. If using a bleu cheese or Parmesan, gently crumble and stir in the cheese after the final ladle of stock has been absorbed. slow food. good friends. organic and sustainable food sources. 801 Franklin is firmly committed to celebrating local artisanal foods and fostering a more sustainable food supply. We firmly believe great food begins with a healthy planet and environmentally sound practices. Subscribe To kitchen. wine. cocktails. Harvest Slow Food- A Celebration of Real Food!